Kaden has started his Pre-Nursery class this January! It’s a short class, 2 hours a day, Mondays to Fridays. I feel it will be a good introduction and exposure for him to the school environment. More importantly, to mix with other kids and learn to be social. Two weeks later after he started, I received a notification form from his school that they would be commencing a home school reading program for the kids soon. This is a fairly new program, launched only last year. So I’m glad Kaden would be involved in this take home reading program right from the beginning of his preschool days. I agree with his preschool’s explanation that experiences with books would serve to expose the kid to both fiction and non-fiction experiences. In addition, it entails parental involvement and helps the child to develop reading, communication and writing skills. Under this program, each child will be given a copy of book to bring home to read. As Pre-Nursery kids are between 2.5-3.5 years old, this would mean that one of the parents would be reading the book together with the kid. 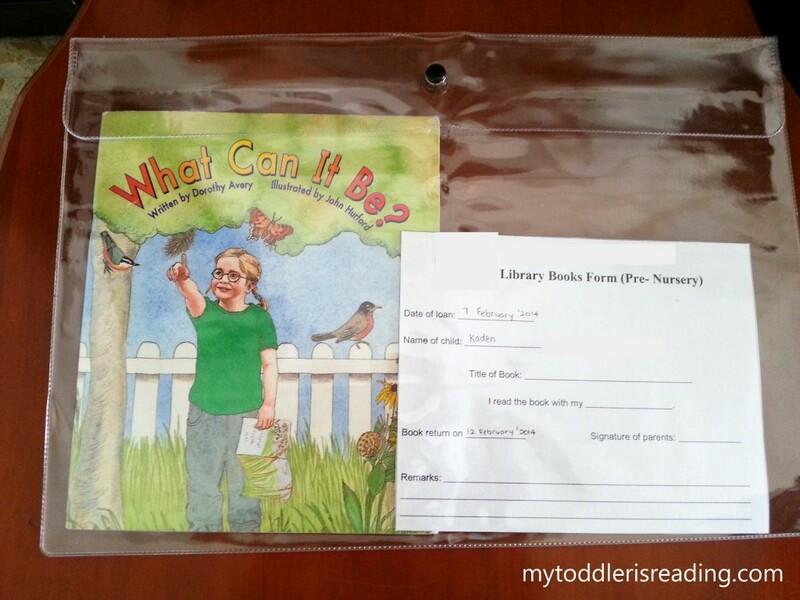 Last Friday, Kaden was given his first take home reader which was placed in a plastic folder together with a Library Books Form as can be seen above. His first book title is called “What Can It Be?” by Dorothy Avery. We’re given 5 days to return the book back to the school. While I casually flipped through the book, my sister and I saw square cutouts on several pages of the book. My sister remarked that the book has been cut out by some children. I thought, what neatly cut out squares. On Sunday evening, I took out the book and intended to read it together with Kaden. When I flipped to the first page, there were only a few words and then two square cutouts on the corresponding page. Then I realized the cutouts are to give peeks into parts of an animal so the child could have a guessing game! Though a simple book, Kaden had fun trying to guess which animal would appear on the next page. He couldn’t guess the first animal which was a lion, he managed to guess the zebra, and though he couldn’t guess the flamingo but I was glad he managed to read the word “flamingo”. Meanwhile, we are at his final lesson for his reading program! After this, I would concentrate on regular book reading sessions with Kaden. Be it that I read aloud to him, or that I get him to read to me so he can practice and hone his reading skill. We’re lucky that Kaden has received quite a number of passed down books from his older cousins. And now with his school’s home reading program, his book choices would widen. Does your kid’s school has a similar home reading program? Do you think such home reading program by school would benefit the preschoolers?